DENVER (AP) -Jose Theodore's confidence never faltered. Even when he was struggling earlier in the season, and sharing the net with Peter Budaj, he knew he'd get back to his MVP form. Now, he's showing it. Theodore stopped 27 shots for his second shutout of the season, Wojtek Wolski scored and the Colorado Avalanche won their fifth straight, beating the Anaheim Ducks 1-0 on Thursday night. 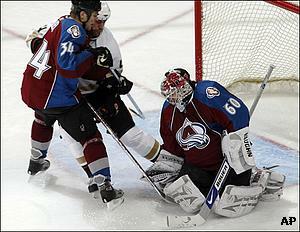 "I've always believed I could be one of the top goalies in this league," said Theodore, the 2001-02 Hart Trophy winner. "I put a lot of pressure on myself. So far, things are going well." Theodore has been in net for all five victories, giving him his longest winning streak since March 2004 when he was with the Montreal Canadiens. It was also Theodore's 25th career shutout. "I don't want to get carried away," said Theodore, who had his other shutout this season at Tampa Bay on Jan. 15. "We've got to really turn the page quick and focus. We haven't achieved nothing yet. We're still in a tight race." The Avalanche are making that race even tighter. They're now a point behind Minnesota and Calgary in the Northwest Division. The Ducks have quickly gone from rolling to reeling. They have now been shut out in back-to-back games, losing 3-0 to the Chicago Blackhawks the night before. Anaheim had won six straight wins before its slide. "You don't feel good when you lose," said Jonas Hiller, who was spelling Jean-Sebastien Giguere and made 29 saves. "It's tough to win when you don't score goals." This may not help their cause. Corey Perry, the Ducks' top goals scorer, was carted out of the arena on a gurney after the game with a laceration above his knee. "They took him to the hospital to get stitches," Anaheim coach Randy Carlyle said. Carlyle still isn't sure how the injury to Perry happened, other than he skated to the bench with a cut after a collision near the Avalanche goal midway through the third period. "He had a slit in his socks," Carlyle said. "I never saw it." The Avalanche are 5-0 since signing Peter Forsberg and acquiring defensemen Adam Foote and Ruslan Salei just before the trade deadline. Colorado also keeps rolling along in March, winning its third straight. Last season, the Avalanche went 11-1-2 in March, tying the franchise record for wins in a single month, but narrowly missing a playoff spot. "I thought we played well across the board," Avalanche coach Joel Quenneville said. If ever a forward needed a goal, it was Wolski, who hadn't scored in 15 games. The Avalanche even tried benching Wolski to shake him from his funk. Wolski scored his 15th goal of the season after taking a pinpoint pass from Andrew Brunette on the wing and directing it through the pads of Hiller midway through the second period. "It's nice to see him get that monkey off his back," Quenneville said. The Ducks had a chance to get on the board early in the game when Perry had a breakaway on Theodore, who stuffed the shot when Perry tried to backhand it past him. It was just that kind of night for Anaheim. "We have played six periods and haven't scored a goal," Carlyle said. "You can't continually accept that. (Theodore) made some big stops. He was counted on." Theodore said the explanation behind his recent success is simple - consistency. He's also seeing the puck well. "I've just got to keep doing the same thing over and over," Theodore said. "The guys are playing well in front of me." Notes: Colorado D Jeff Finger was back in the lineup after missing six games with a hand injury. ... Anaheim finishes the season series against Colorado having won three of four. All four games were decided by a goal. ... Forsberg had one shot in nearly 22 minutes of ice time in his second game back. He also set up quite a few scoring chances.